The research vessel Petrel made history in 2017 when it discovered the wreck of the USS Indianapolis, which was sunk in 1945 by a Japanese submarine in one of America’s worst naval disasters. 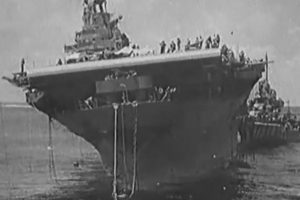 Now, that same crew is focusing on the whereabouts of the USS Hornet, one of the most fabled carriers of the World War II, the ship that launched 1942’s famous Doolittle bombing raid on Tokyo. You might think looking for an aircraft carrier, something so big, would be a straightforward thing. But the South Pacific is a big ocean, and east of the Solomon Islands, it’s about three miles deep. So, where to start looking? This search begins in Ironbottom Sound, the infamous graveyard for ships and men around Guadalcanal, where some of the most intense and costly naval battles of the Second World War were fought. It’s where the RV Petrel and her crew begin the hunt for a wreck that’s been lost for 77 years. The Hornet was engaged in the 1942 battle for control of the skies over Guadalcanal, where U.S. Marines were holding a crucial airstrip the Japanese desperately wanted back. It was a new kind of sea war. Richard Nowatzki, who was 18 that day on the Hornet (he’s 95 now), spoke to correspondent Mark Phillips about the attack on his ship: “I looked up, and there was a Japanese dive bomber on his way down with his tracer bullets coming out of his wings, right at me! The Hornet was finished. One hundred and forty of her crew were dead. The rest were ordered to abandon ship. The Japanese then sank her. It was tactical victory for the enemy, as the Hornet became another wartime tragedy, another lost grave. The Petrel has come to try to find it. In 140 square miles of ocean, they’re looking for the proverbial needle in a haystack. But Rob Kraft and his team have done their homework. In a project funded by the late Microsoft co-founder Paul Allen, who had a passion for maritime history, they’ve outfitted a state-of-the-art, deep-sea research vessel. They’ve researched records from other ships involved in the battle, and plotted where those ships thought they were. But in battle, records are often unreliable. They even looked at records in the Japanese naval archives from the ships that sank the Hornet. “So, the U.S. narrative and the Japanese Imperial navy, wartime navy logs, both point to the same rough place?” asked Phillips. “Yeah, in close proximity, so that’s a good clue,” Kraft replied. A good enough clue to go have a look. The Petrel dropped a torpedo-shaped underwater drone over the side. It’s programmed to dive down – in this case more than three miles down – and to scan the bottom with sonar waves, looking for something that shouldn’t naturally be there. After about an hour and a half trip to the bottom, the probe starts its first survey. It’s a tense time; only when the thing is retrieved and its data examined does the crew know if it’s found anything. The data shows mile after mile of empty seabed … until what looks like debris. Has it found something? The scan shows something that looks suspiciously like a ship, but is it enough to warrant another dive? “I’m thinking about it, yeah,” Kraft said. He didn’t think for long. Only the Petrel’s camera-laden, remotely operated sub can find out if it’s a ship, or the ship. It’s not a dive machine being launched over the side, it’s a time machine – things that go down through the water, and back into the past. The search for the Hornet – three miles down and from 77 years ago –continues on “CBS This Morning” tomorrow.